Perú, the land of the Incas, that civilization that coexisted harmoniously with nature, has inherited precious sites worth visiting. Machu Picchu, the figures in the Nazca desert, pre-Hispanic archaeological sites, Lake Titicaca, plus the infinite landscapes, waterfalls and valleys that adorn this beautiful country. 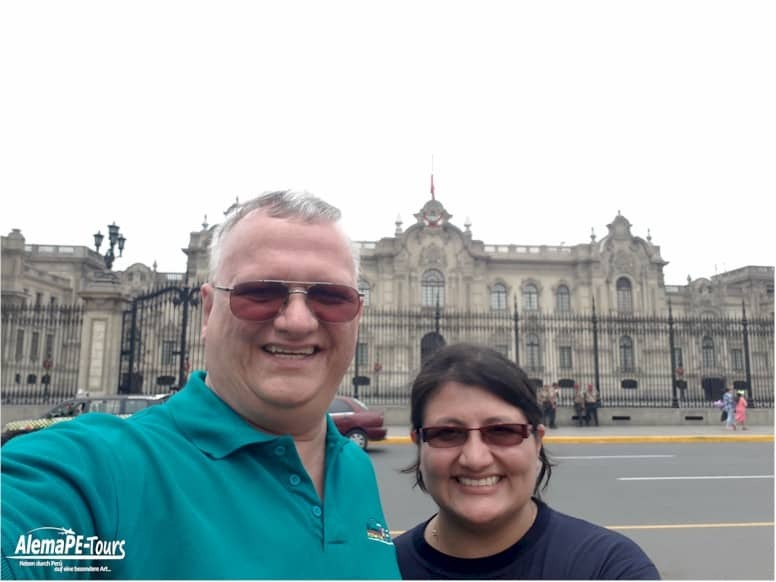 The capital of Perú, the most important city in South America during the Spanish colonization, keeps countless secrets since its founding in 1535. 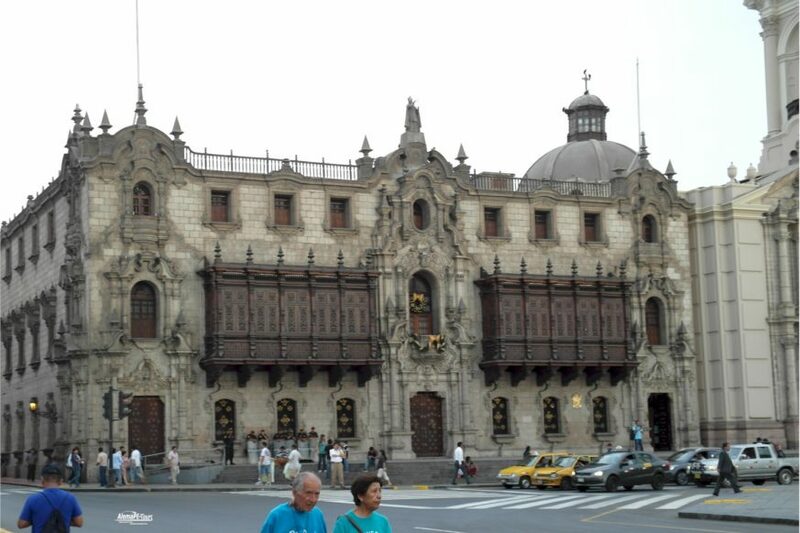 Today we will see the places you can not miss in a tour of the historic center of Lima in Perú. Lima is the political and commercial center of Perú. It is also the third most populated metropolitan area in the world and the fifth in Latin America. He has several nominations in the World Travel Awards South America 2017, in sports tourism, green destination, cultural and adventure destination, among others. 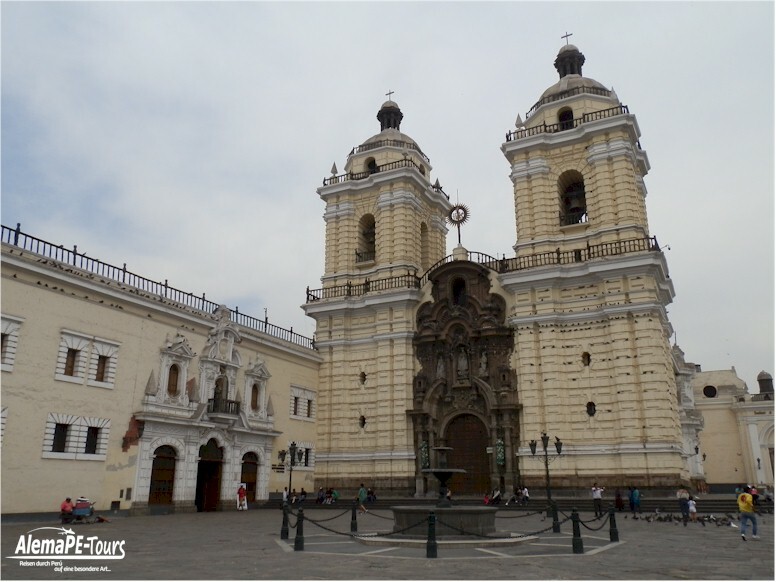 The historic center of Lima was declared a World Heritage Site in 1991. 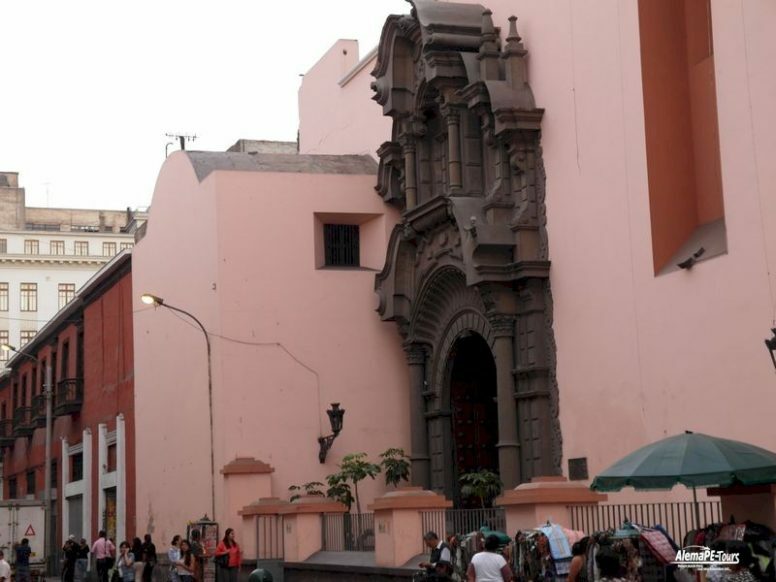 Sites to visit in the historic center of Lima. Where the monument to Don José de San Martín is exhibited. 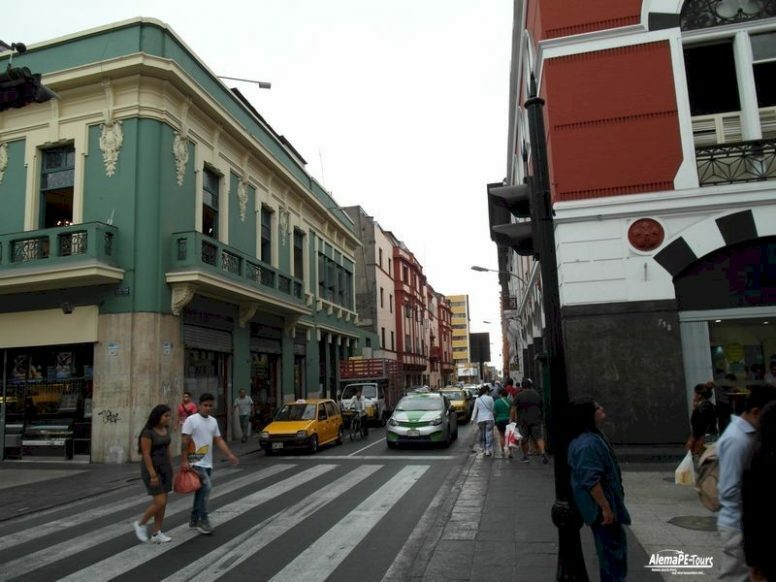 You will find buildings from the first half of the 20th century with Art-Nouveau and Neo-Colonial styles. Around the square are some grandiose buildings, such as the Teatro Colón and the National Club. The Gran Hotel Bolivar was built at the beginning of the 20th century. With its elegant Art Nouveau light fixtures, sweeping staircases and antique carpets, it is reminiscent of its great era of luxury hotels. 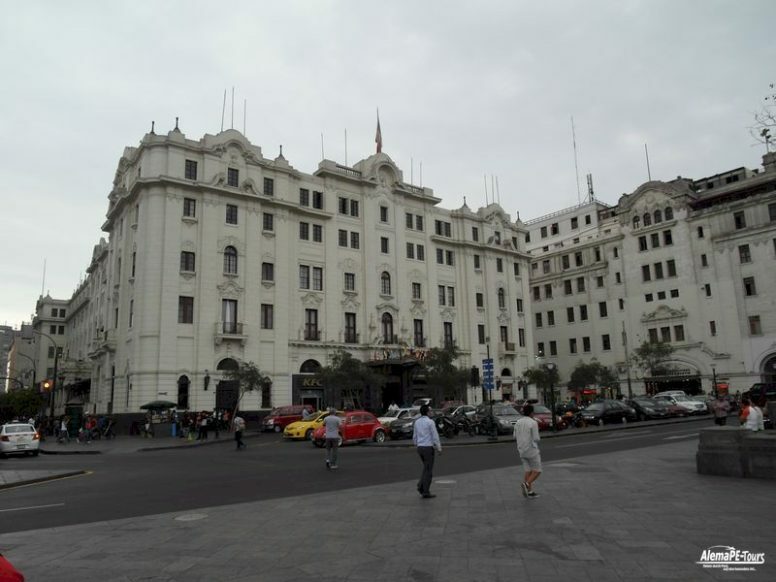 In many films of the history of Lima is always shown this magnificent Gran Hotel. The other buildings around the square are mainly built in the Art Nouveau style and are reminiscent of the golden era of the 20s and 30s. Opened in 1920 with Renaissance style and restored in 2010 after 12 years of a fire that caused serious damage. Initially in this place there were only small stores and shops. Bullfights were also held and it was the site of death row executions. This was where José de San Martín proclaimed the independence of Peru. Today it shows a varied architecture in its buildings of a political and religious nature. 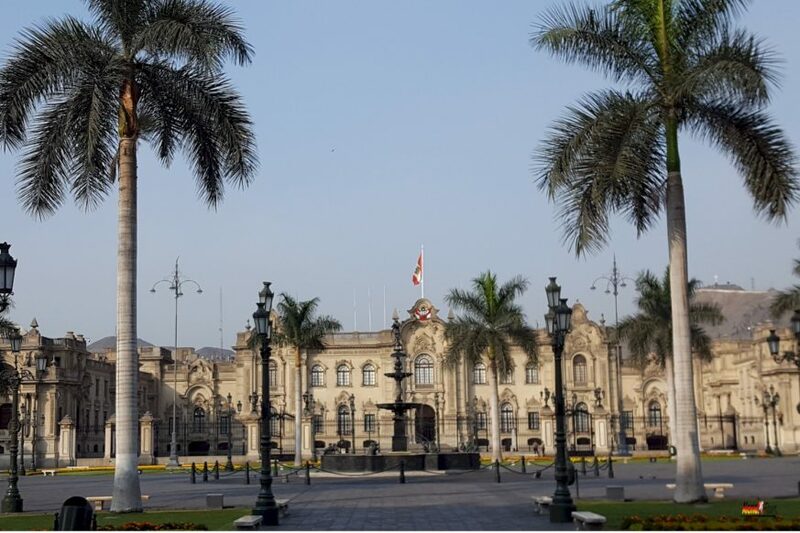 The Government Palace of Peru, The Cathedral of Lima, The Sagrario Church, The Archbishop’s Palace, The Municipal Palace, The House of the Oidor and The union club among others. 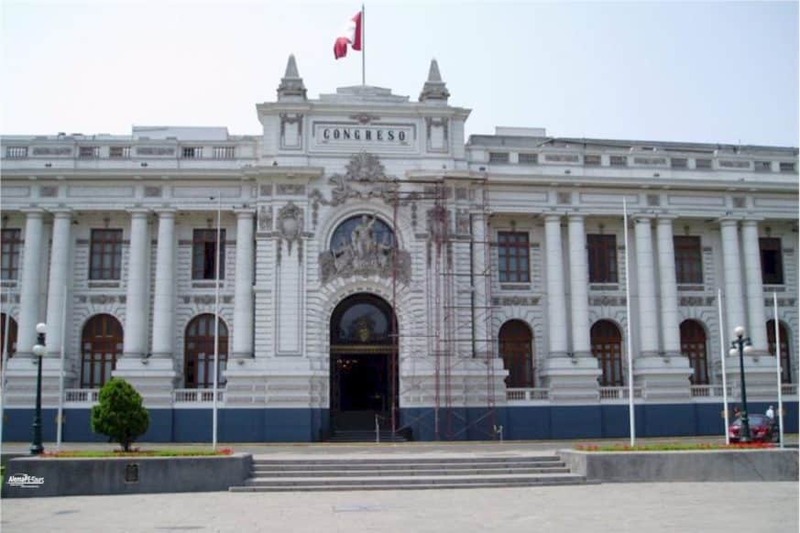 The Palacio Municipal de Lima or City Hall of Lima is a public building that serves as headquarters of the Metropolitan Municipality of Lima. The Government Palace was built by Francisco Pizarro, the governor of New Castile in 1535. 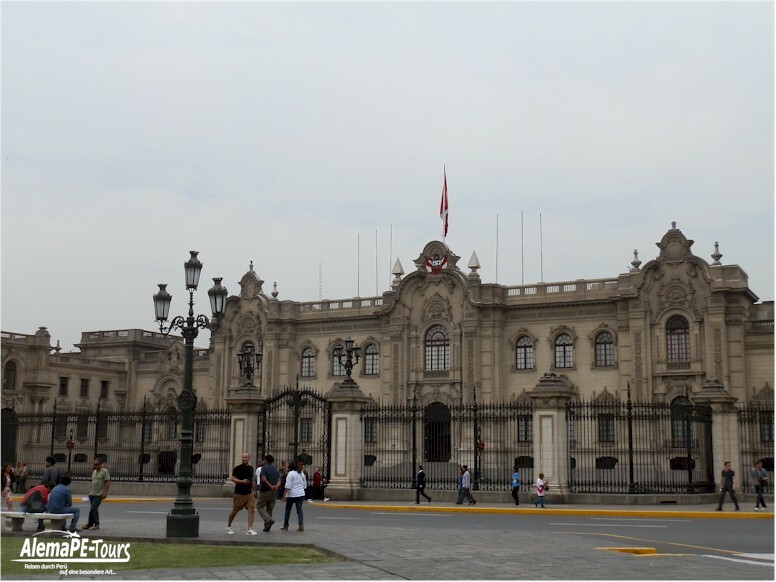 When the Viceroyalty of Peru was established in 1542, the palace became the viceroy’s residence and headquarters of the government. The building’s most recent transformation concluded in the 1930s under the direction of President Oscar R. Benavides during the course of his second term. The main architect of its last rebuilding was Ricardo de Jaxa Malachowski. 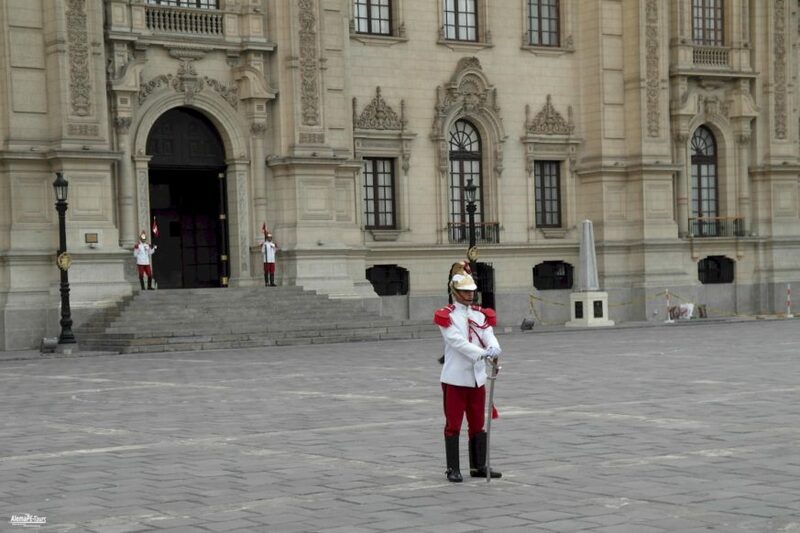 At noon you can witness the changing of the guard at the Government Palace by members of the Cavalry Regiment. The Gran Hotel Bolívar, is a historic hotel located on Plaza San Martín in Lima, Peru. Designed by noted Peruvian architect Rafael Marquina, it was built in 1924 and was the first large, modern hotel built in Lima. 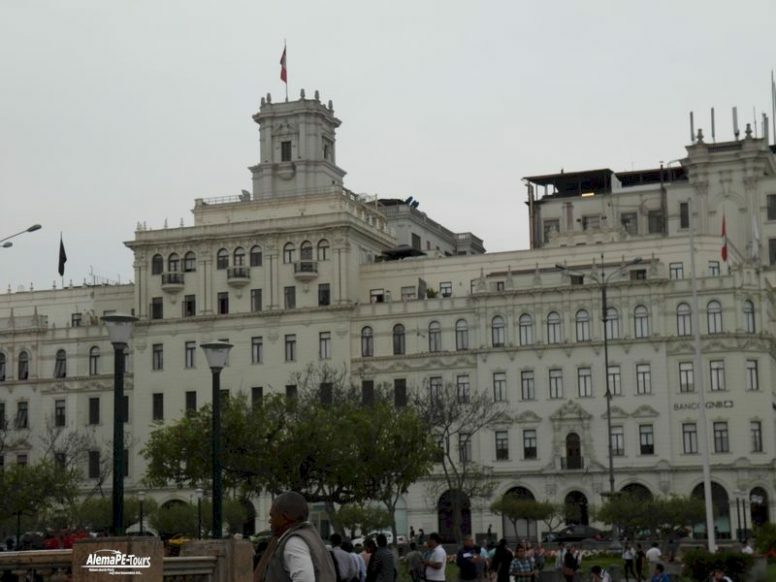 Part of a program to modernize Lima, the hotel was constructed on what was state property. The hotel was inaugurated on December 6, 1924, in honor of the centenary of the Battle of Ayacucho, a decisive military encounter during the Peruvian War of Independence. 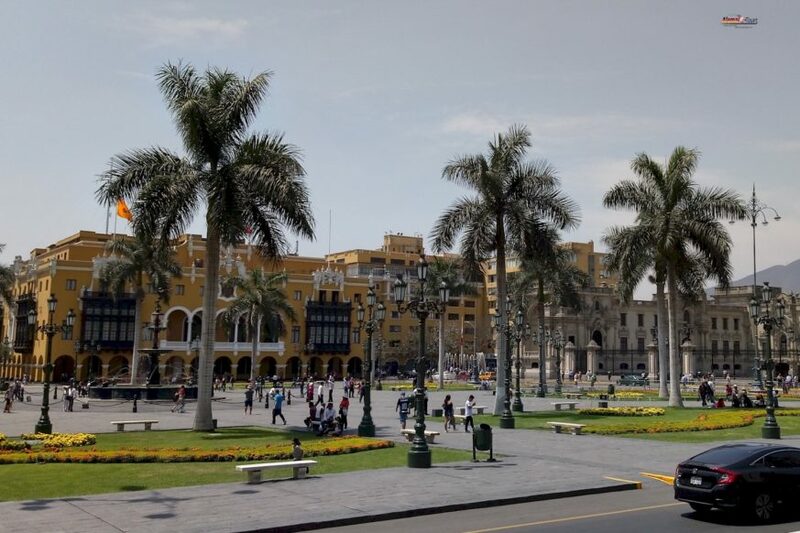 The square itself was inaugurated on July 27, 1921, in celebration of the 100th anniversary of Peru’s independence. In the 1940s and 1950s, the hotel attracted Hollywood movie stars such as Orson Welles, Ava Gardner, and John Wayne, where many also discovered the local cocktail, the Pisco Sour. Here you can also get a very good “Catedral”, a double Pisco Sour the size of a Pilsner glass. Please take something in advance, as this will surely be a good end to the day. Baroque style and a 30 minute walk through the catacombs. 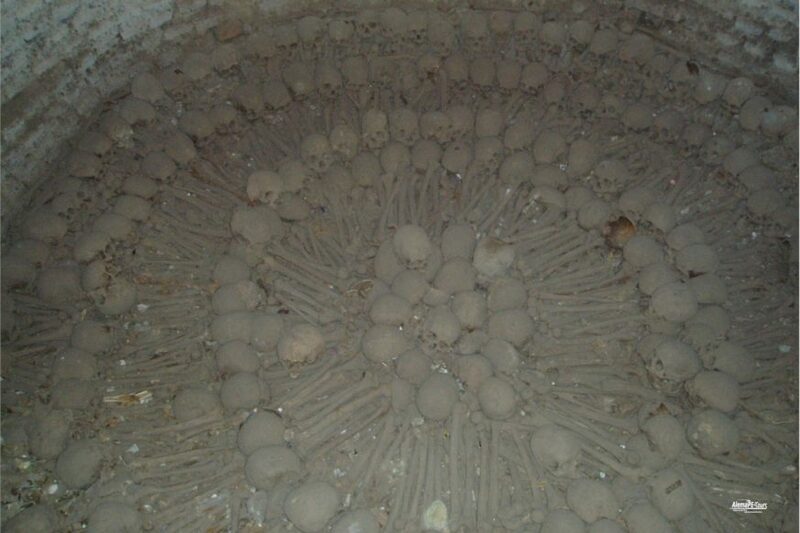 You will be able to observe how they accommodated the human remains for their better distribution. They say it could hold up to 25,000 people. The payment of the entrance is in cash. Opened on the banks of the river Rímac in 2004. You can see remains of the wall of the colony and houses of the Republican period. The park has an extensive recreational area on two levels. There is also a museum, cafeterias and recreation services. The square is framed by the radial streets, whose facades mostly form the same architectural pattern. The original design had a harmonious set of republican buildings that had been painted completely blue and their condition worsened further, and in them the followers of small political groups have found their meeting places. 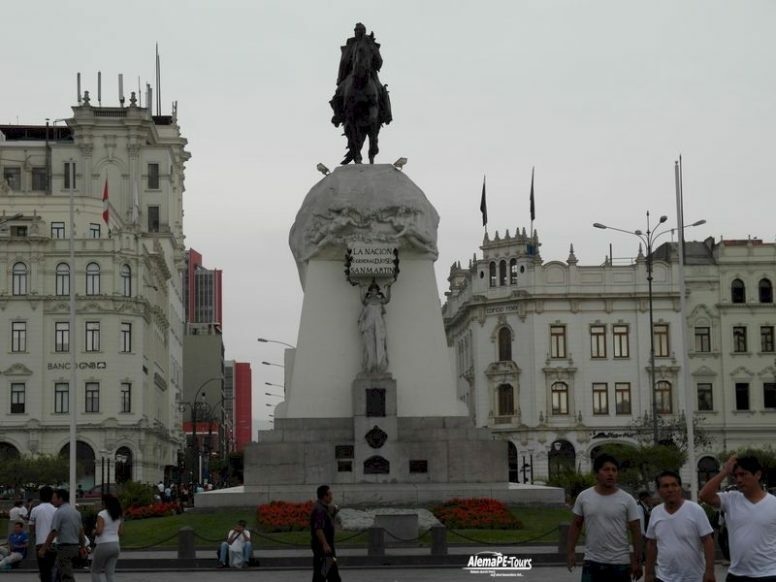 In the middle stands an obelisk, crowned by a triumphant hero sculpture that raises the Peruvian flag in one hand and holds a revolver in the other. It is the work of the Peruvian sculptor Artemio Ocaña made of bronze, material from three tons artillery projectiles. This sculpture does not correspond to the original monument, which was changed in 1954 during the reign of Manuel A. Odría. The original sculpture of the Plaza Bolognesi, designed by Agustín Querol, 1905. Today it is in the Historical Museum of Real Felipe. The original sculpture by Spanish sculptor Agustín Querol featured a Bolognesi clinging to a flagpole with his head bowed, about to collapse, showing him the moment he is killed in battle. From the very beginning, this depiction triggered critical points, such as those of the famous Manuel González Prada, who believed that the Bolognesi sculpture was not a heroic pose. None of the successive governments dared to change the sculpture until it finally happened during the reign of President Manuel A. Odría (whose second vice president was Federico Bolognesi Bolognesi, grandson of the hero of Arica). The Peruvian sculptor Artemio Ocaña was commissioned to produce the new sculpture. In the view of the then authorities this replacement was necessary because the hero in the portrayal of Querol “seemed drunk”. This change brought many criticisms of those who considered the old Querol sculpture a fine work of art. Art that was arbitrarily withdrawn by decision of one dictatorship and replaced by another of lesser quality. One of these critics was the then young journalist Mario Vargas Llosa, who did not call the replacement sculpture a “grotesque puppet”. Numerous chapels will delight us with the beauty of its interior. The Renaissance style that remains after numerous reconstructions after supporting 9 earthquakes since 1609. 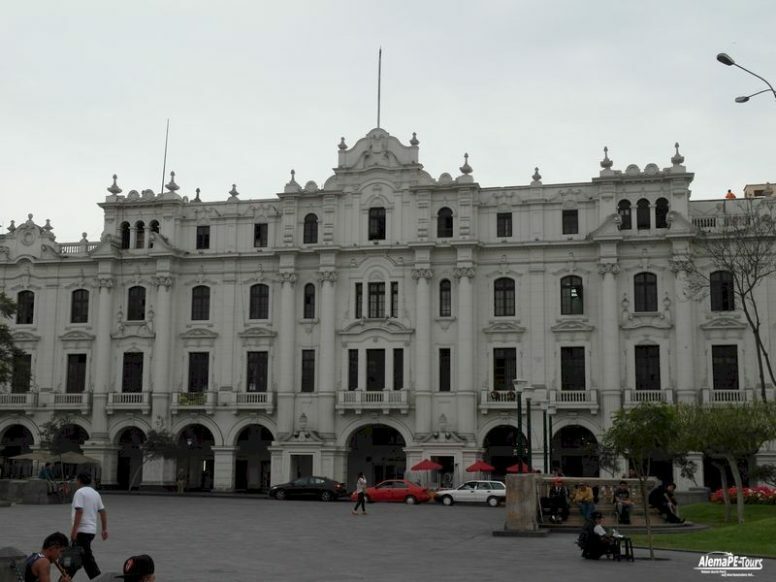 Located on the land that Francisco Pizarro allocated to be the residence of the head priest of Lima after the foundation of the city in 1535, the current building was opened on December 8, 1924 and is considered a prime example of neo-colonial architectural that developed in Lima during the early twentieth century. 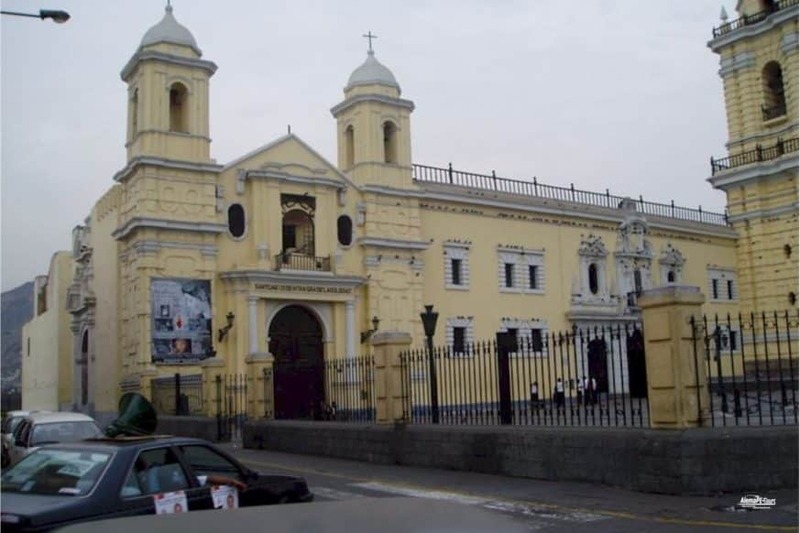 The old Archbishop’s Palace was built on the place the Limean cabildo had occupied from 1535 to 1548, when that institution moved to its current location across the square. The building had six balconies of different styles and several entrances, displaying the Archdiocese coat of arms above the main gate. The architectural features of the courtyard were similar to those of several cloisters in the city. The old palace façade was demolished in the late 19th century along the Sagrario. The remaining structure was demolished prior to the construction of the present Archbishop’s palace. The current building was designed by the Polish Peruvian architect Ricardo de Jaxa Malachowski, who used the Torre Tagle Palace as a reference point. 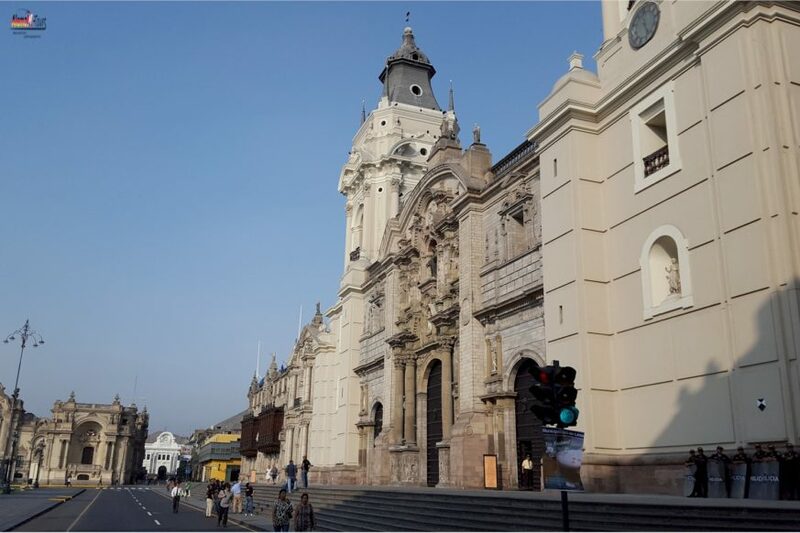 Erected joined to the Cathedral of Lima, the location formerly belonged to the city’s first police station and the city’s first jail. After Pope Paul III designated this temple as the primary church headquarters of the city, the location became the current location of the Archdiocese. The facade is made up of baroque elements, completely made of reintegrated rock; ornate cedar balconies are located over the main doors, and the palace is finished by a granite sculpture of Saint Turibius of Mongrovejo the patron protector of the Archdiocese. 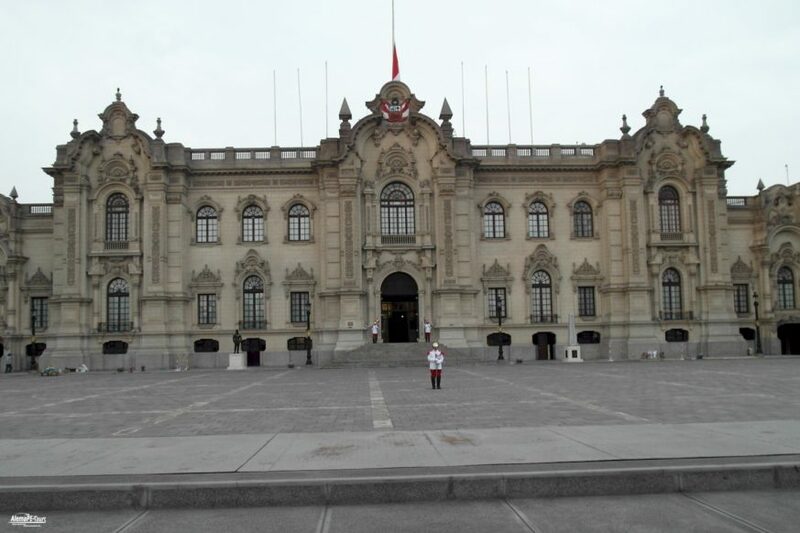 The palace also consists of two flagpoles, one for the Peruvian flag and another for flag of the Vatican. The interior is completely ornated and is home to a sculpture of Santa Barbara the patron of Cuba. The ceiling is illuminated by famous French stained glass windows allowing the entry of light. The interior also contains marble staircases with wooden handrails which allow access to the second story. Pedestrian walk of several blocks with stores and commercial businesses. You can see the life of Lima at its best. The colonial houses with their characteristic balconies are the emblem of this route. 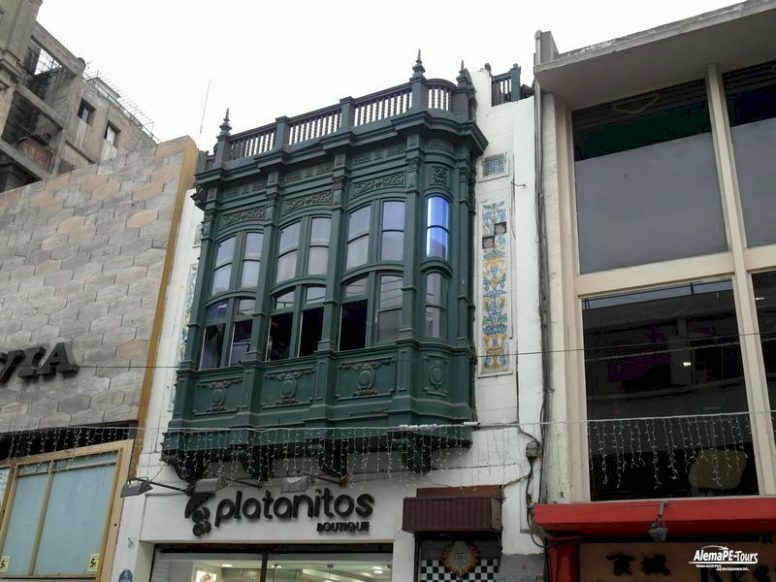 The House of Peruvian Literature in Lima is located in a beautiful place and also has a very unusual story. 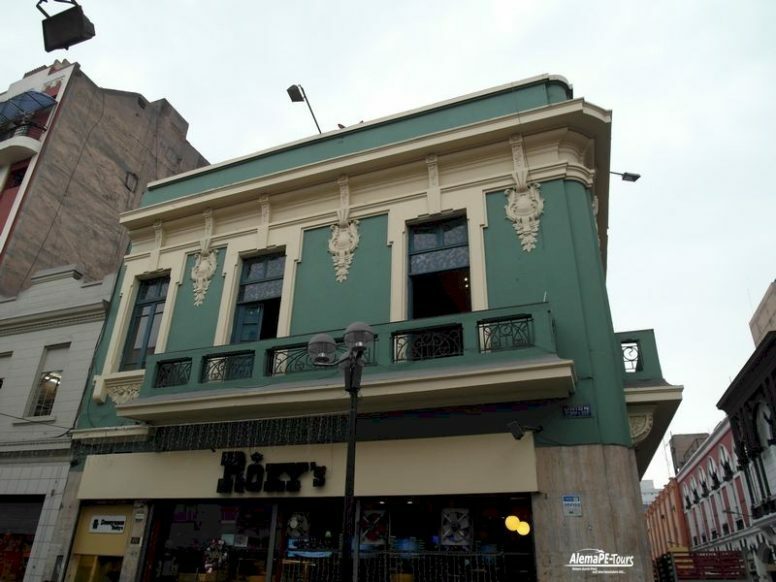 Opened in 1912 as a former station opened construction stands between dam Plaza Mayor and the Rio Rimac. The building with its neoclassical architectural style is still very much worth seeing today. The old station building still exudes a certain travel flair. The pillar galleries and staircase design with a grace of a ruler’s seat. The ceilings of steel structures and glass reinforce this impression as they bring a lot of natural light in the rooms and offer the visitor a homely atmosphere. The old station clock at the entrance and the antique-looking sales counter of the station can still guess what it could have been like when there was still a busy passenger and transport circulation on the tracks, which today seem very deserted. After a major renovation in 2009, the building was converted into its current function as a library, exhibition and cultural center. 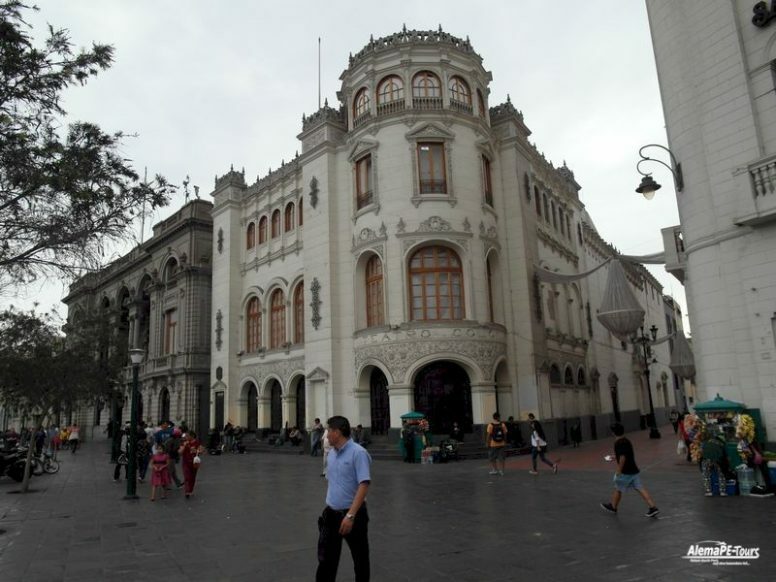 Its central location in the historic district of Lima makes the building an interesting point on any city tour. Just opposite the street corner is the Restaurante El Cordano, where prominent politicians quickly grab a sandwich or a Serano del Norte sandwich between appointments. Here are always pleasant breaks during the city tours made. 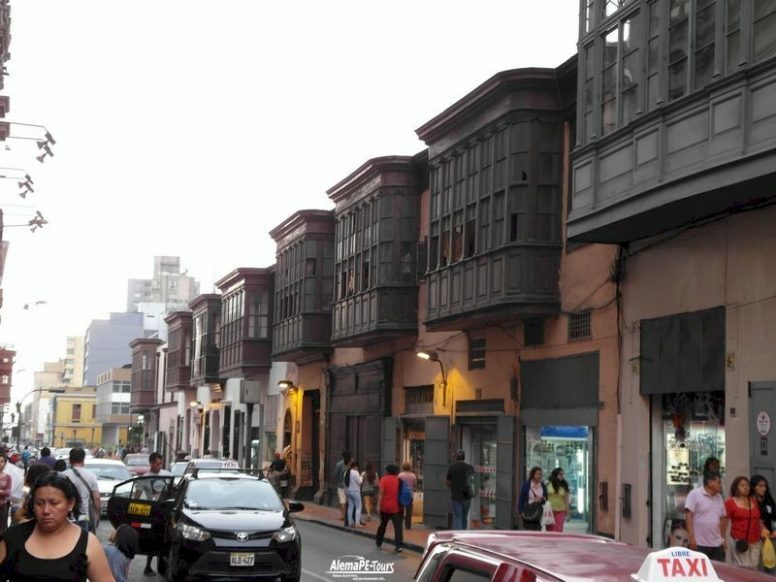 Paseo de los Héroes Navales is located a few blocks south of Plaza San Martín in the UNESCO World Heritage listed historic city center of Lima. It’s a long stretch filled with sculptures, bushes, and flowers. It was built in the 1920s. Constructed underneath it is a Metropolitano station, Estación Central. If you decide between the Paseo and the Plaza San Martín, you should take special precautions, as there are always messages about thefts and handbag robbery appear in the daily messages. Stay together in groups, carry your bags a little closer to the body as usual. That should be enough to be uninteresting for pickpockets. 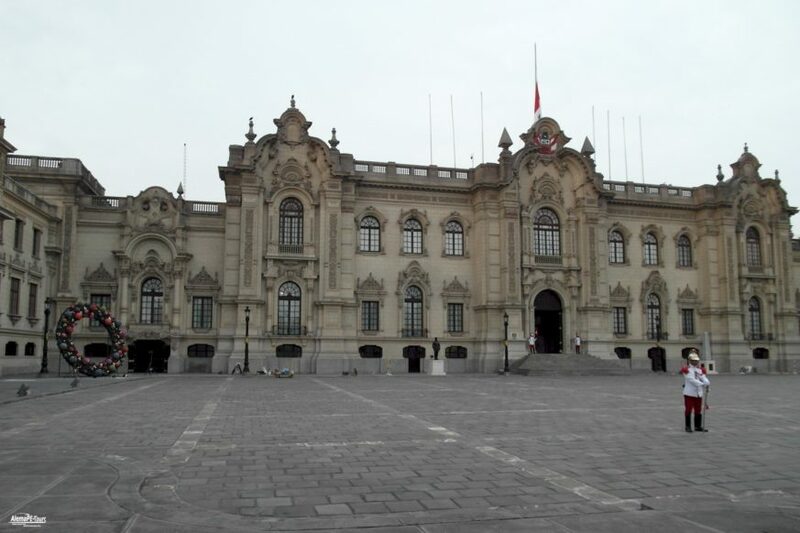 The Palace of Justice (Spanish: Palacio de Justicia) is the seat of the Supreme Court of Peru. 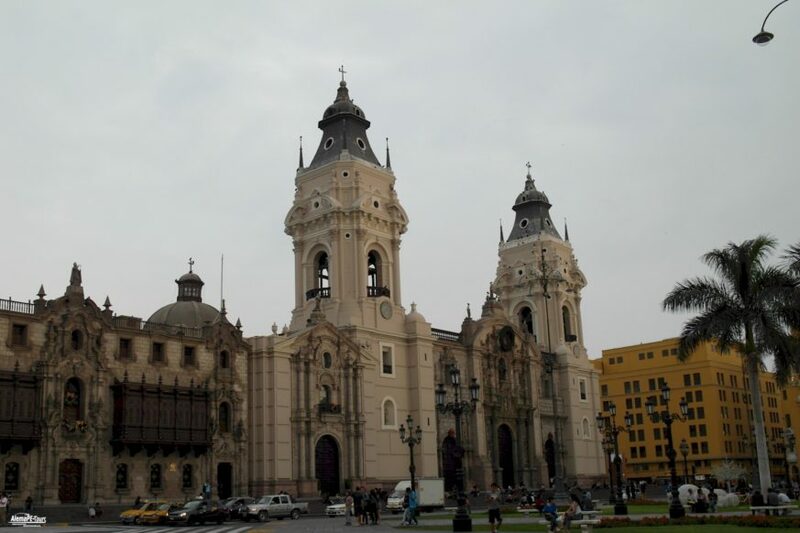 It is located in the Lima District of the city of Lima, capital of Peru. Construction started during the second government of Augusto B. Leguía (1919–1930) and finished under the presidency of Óscar R. Benavides, who inaugurated the building in 1938. The Palace was built in a neoclassical style as its plans were based on those of the Law Courts of Brussels, Belgium, work of Joseph Poelaert. However, it lacks the dome of its Belgian counterpart and it is significantly smaller (though still not small by any means). 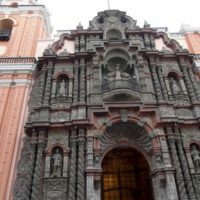 The Metropolitan Museum of Lima proposes an audiovisual tour through the pre-Hispanic, viceregal and republican history of the city of Lima. The museum offers scenography and audiovisual projections in 2D, 3D and 4D. In addition, the temporary exhibition hall of the Museum manages exhibition proposals that reflect on the history, society and culture of Lima. On the other hand, the Museum has a Reading Room for Children and a Library, and performs various events and cultural activities aimed at the entire community. Art has a long tradition in Peru. And as there were many political and thus cultural changes in the course of the existence of the cultures living there, the Peruvian art can boast many facets. The Museo de Arte de Lima (Mali for short) is located in the Palacio de la Exposición. This palace was built in 1871 specifically for exhibitions. After a long time as a kind of fair building, the seat of the Society of Fine Arts and even used as a barracks for the Chilean troops in the years of the Pacific War, the first museum was opened in 1959, which should be dedicated exclusively to artistic work: Mali. 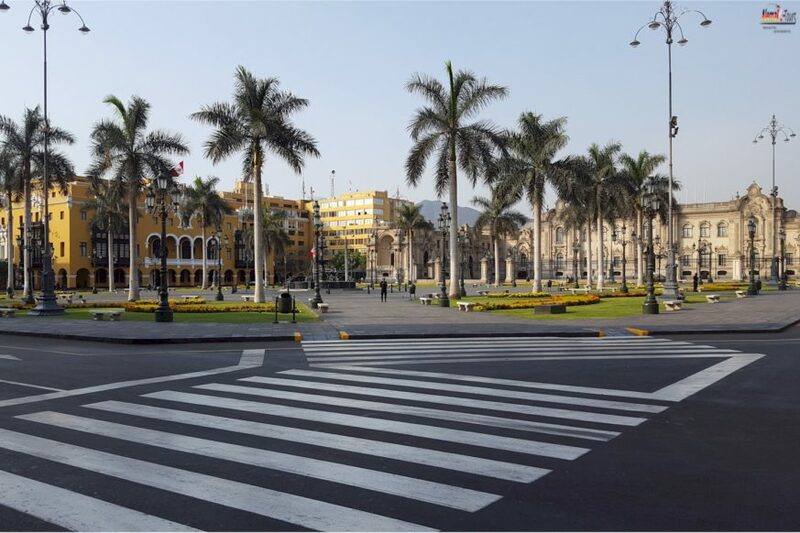 Lima has always been known as the city of gardens when it comes to its parks. The district of Miraflores has repeatedly invested heavily in the design of green spaces and parks, improving and expanding them. For years, a special focus has been on the Malecón, a 6-km park on the cliffs high above the Pacific Ocean bypass. This area is also part of the Costa Verde (the green coast) of Lima. The Malecón is occupied in the morning and in the evening by countless joggers, cycling and pedestrians. You can be active in sports here or just go for a walk and enjoy the view. On the way through the various parks are statues created by famous Peruvian artists. The two most famous sculptures are located on both sides of the Villena Bridge, which extends over a deep ravine in the middle of the Malecón. Immediately behind the sun bridge (Intihuatana) is the Víctor Delfín massively carved couple, sunk in deep embrace. This part is one of the central pieces of the Malecón, also known as the Parque del Amor (Lovers’ Park), whose design is strongly inspired by Antoni Gaudí, notable for its mosaic-decorated benches. The modern shopping center Larcomar above the bypass on the Costa Verde (the green coast) invites you to a shopping tour in one of 160 shops and also leisurely stays with a café or a longdrink. The architecturally innovative building has received several awards. The center was built on a cliff just above the ocean. In recent years, a lot has been put into the renovations of the plant. Enjoy a fascinating combination of panoramic views of the Pacific Ocean and elegant shops. Or let yourself be pampered in one of the more exclusive restaurants with sea views. The ambiance is rather exclusive and posh for Peruvian standards, and reflects the affluent atmosphere of Miraflores. The shopping center also houses a cinema, a theater, a gallery and an area with a bowling alley and an arcade. A beautiful property with great views of the Pacific. 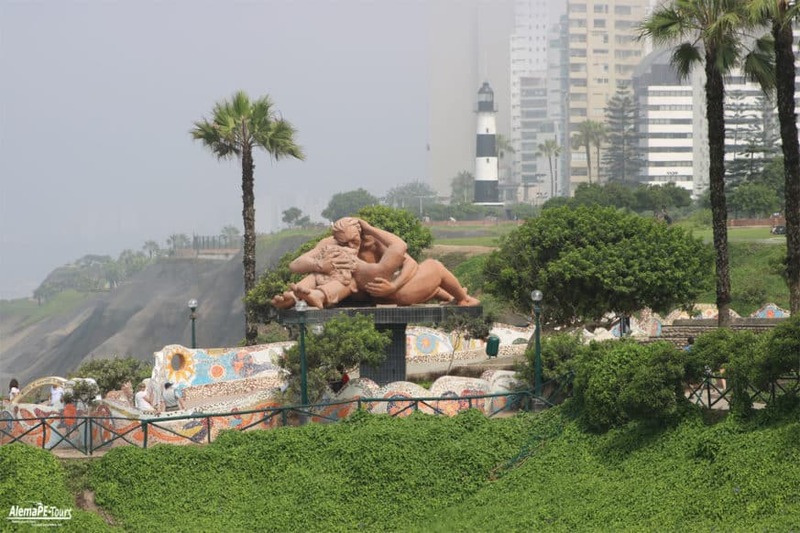 Opened on 14 February 1993 (Valentine’s Day) Parque del Amor, the park of love, is located on a cliff between the Malecón Cisneros and the Malecón de la Reserva in the district Miraflores. At its center is the twelve meters long and three meters high sculpture “El Beso (The Kiss)” created by the Peruvian artist Víctor Delfín. It shows how two lovers kiss each other tightly. Striking are the colorful, decorated with mosaics curved benches with Liebessprüchen. From the park you have a spectacular panoramic view of the bay of Lima and the Pacific especially at sunset. The park invites you to stroll and offers countless photo opportunities. It is not a sculpture park, but a park surrounded by mosaic-covered walls. Here you can discover a lot. The main sculpture of the park (El Beso) is probably the best known photo place on the Costa Verde. 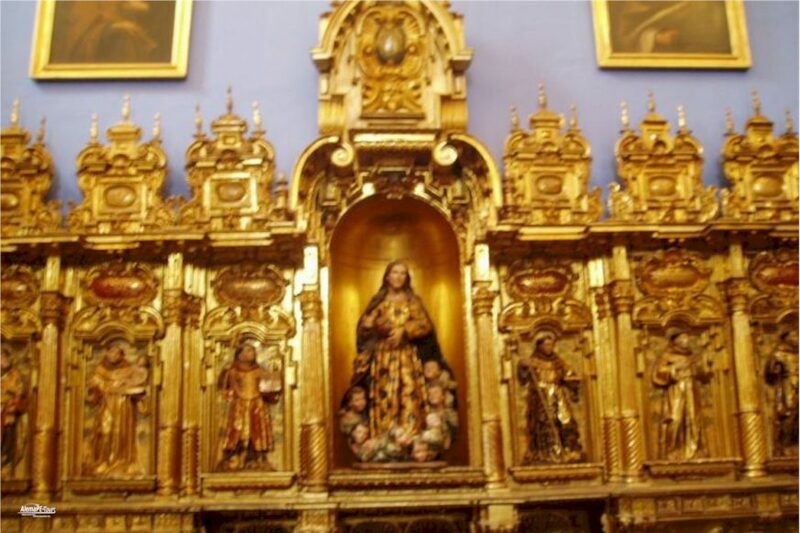 The Pedro de Osma Museum has a fantastic colonial art collection with paintings (16th-19th c.), Sculptures of all kinds (wood, stone, marble), furniture, textile objects, engravings, etc. The treasures belonged to the Spanish family Pedro de Osma, in whose residence they are presented. The beginning of the 20th century Built building is surrounded by a garden in which sculptures are placed. The Cementerio Presbítero Matías Maestro is a cemetery in Lima, the capital city of Peru. 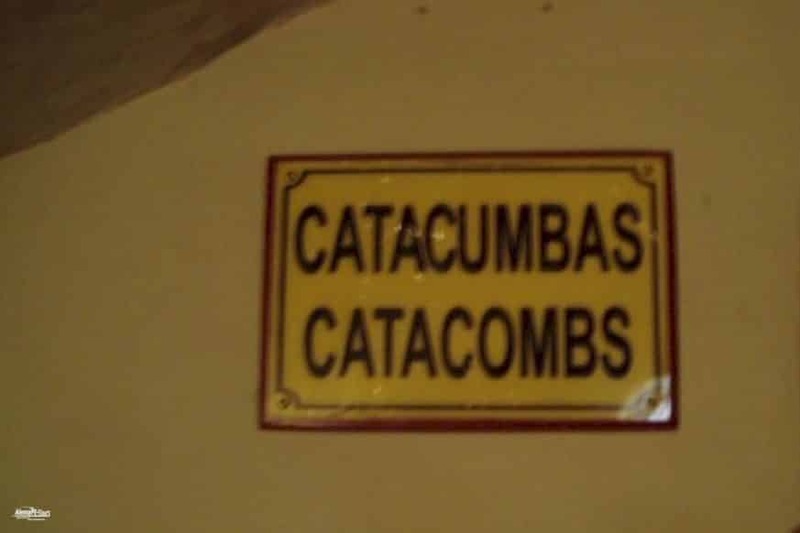 It is also a museum, though attempts to make it a museum exclusively have failed. The architectural styles of the mausoleums found within are broad ranging. It houses the remains of several important political, military and literary figures. Most prominent of all the mausoleums is the Panteón de los Próceres where heroes of the War of the Pacific (1879–1884) are buried. The mausoleum’s entrance reads “La Nación a sus Defensores” (Meaning “The Nation, to its Defenders”). 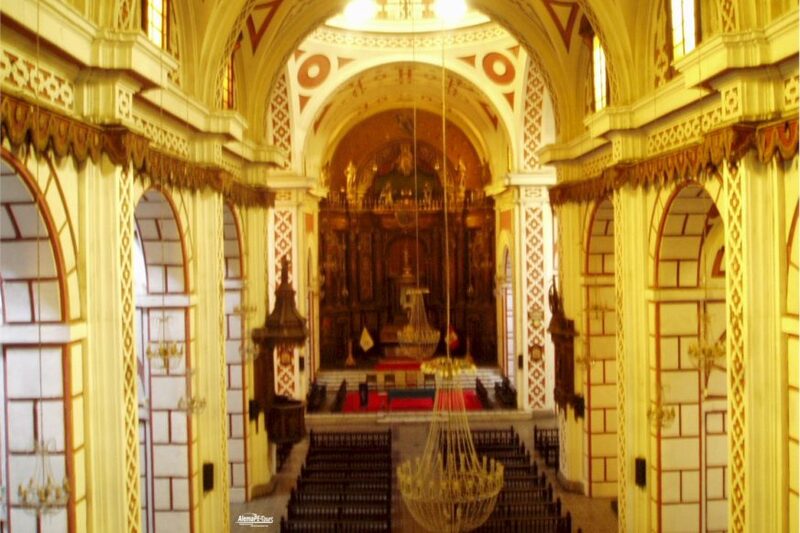 The cemetery was founded around 1807, thanks to the efforts of the Priest Matías Maestro. This multifaceted man, born in Vitoria (Spain) in 1776, came to Peru by the end of the 18th century to start a new business. In 1793, he became a Catholic Priest and since then he dedicated himself to “renewing” the churches and altarpieces with the latest fashion style: Neoclassical. He became General Director of Lima’s Public Beneficence Society in 1826 and died on January 7, 1835.